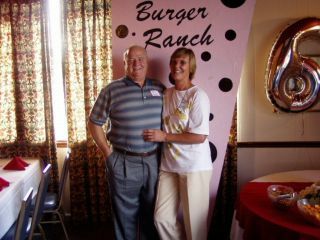 Bob with his wife at the 40th reunion. I joined the Air Force before graduating and was stationed in Italy till 1966. I met my future bride who was on vacation from Germany. We were married in St. Susanna church in Plainfield on February 26, 1966. We have been married for 37 years and hoping for many more. We were blessed with three children. Monica, Andrew and Martina. Our three children presented us with the gift pf six grandchildren: Meagan19, Katriona14, Joshua11, Nathan7, Jacob7, and Hunter 2. We moved our family to Germany in 1971 to continue my education at Schiller College at Bonningheim, Germany, We moved back to Indianapolis in September 1972. I started attending IUPUI and graduated in 1976 with a Bs in Marketing. I have worked for Indiana Bell Telephone and IBM. I started for 3M in 1972 and was transferred to San Diego in 1984 t o August 2001 when I retired from 3M.